With these unique drums Canopus has brought back the drum sound that was immensely popular from the mid 1960's through to their peak in the 1980's. 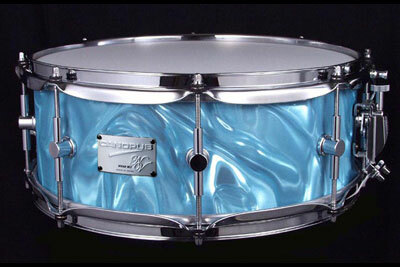 Since that time fiber drums have become increasingly difficult to find. Fiber material has particularly unique sonic qualities when compared to wood or metal shells. Canopus' process is to layer "craft paper" with phenol resin and apply a heat treatment (known as annealing) to the shell. This allows us to considerably harden the surface layers of the shell and extract the optimal sound. The combination of ideal shell hardness and thickness, combined with the perfect bearing edge, has allowed us to recreate the vintage fiber sound - Neo Vintage M3.